Woodpeckers are cute birds but they are also very destructive due to their pecking. They can cause pecking holes all over your house exterior or they can kill any tree from your garden if they peck enough. Not to mention the noise they make. First of all, you have to know that woodpeckers are attracted by insects. And you should cut it from the root by getting rid of insects first from your garden. Woodpeckers are afraid of noises, so use some tin pie pans or wind chimes to get rid of them. Also, you can play music in your garden, if your neighbors are ok with this. You can also install visual deterrents, such as mirrors or glass, over the hole they are attracted to. Or you can put face owls from place to place, because woodpeckers are afraid of these flying birds. And the best option is to attach bird netting 3 inches from your house wall. 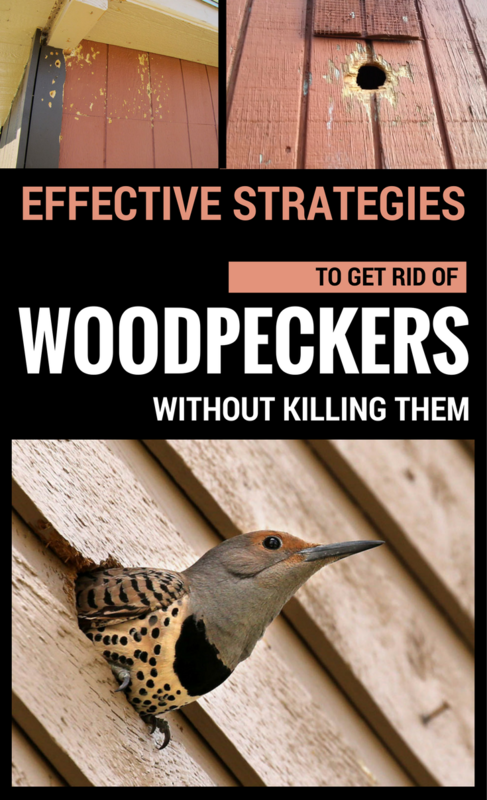 This is the most effective option to stop woodpeckers from pecking your house walls. Instead of trying to send a woodpecker away, you have to think that this bird indicates another problem in your yard: insect infestation. So, you should solve this problem first, then clap your hands to make some noise to get rid of woodpeckers.